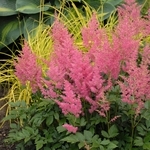 Astilbe japonica 'Rheinland' is a vigorous variety with clear rose-pink flowers. Considered by many to be the best early pink astilbe on the market. Differs from astilbe 'Europa' (soft baby pink) by its richer, rosier pink color.